Some days the rumor mill just seems a tad odd. It’s not that I am surprised a new Tingle game is in the works. The series is popular in Japan and has no end in sight. The issue I have with these rumors is how fast they spread. In fact, you see the news about this game more and more that people begin to actually believe it exists. 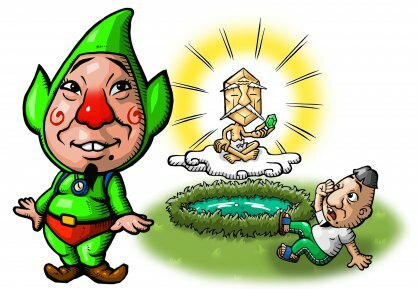 The rumor of this new Tingle game, titled “Kakashi: The Search for Tingle”, all started at a fan site called Zelda In My Pocket. A couple weeks ago, a Zelda fan named “Eldar_Star” contacted us, telling us that Vanpool, the Japanese company responsible for the 1st and 3rd Tingle games, had announced a new Tingle game. At first, we didn’t believe him, as there was no source. However, a few days ago, we received another letter from another reader, giving us a website source that contained the same information. From what we’ve been able to translate from the site so far, it appears that the Japanese title is 恐怖のカラス: うずきの調査, which roughly translates into “Kakashi: The Search for Tingle, or Kakasi’s search for Tingle. Simply from the title, we’ve been able to gain a significant amount of information about what the game will entail. In the next few days, I’ll give you all the link to the actual page, but we’d like to hold onto it for now, as to keep the other websites from snatching it before we’re finished. Also, it might be a hoax, but it’s impossible to tell as of now. Hang tight, and keep checking us out for all of your Zelda news! Naturally there are a few problems with this. For starters, they wont even divulge the website of which this information was gained. It’s one thing to not name your sources for the information, but it’s another to claim to have a website url but not be willing to put it out there. The goal was clearly to get everyone to post about their website, and it worked. Heck, were posting about it. I think the major point here is that if your not willing to even offer what little evidence you have then how can we really say for certain it exists? Grant it, they admit it may be a hoax, but why not do some journalistic research first? For starters, Zelda Pedia claims the title was announced at a random Japanese game conference in April of 2010. They provide no resources for this other than the Vanpoole website. The problem is that in examining the site in full (both with google translate and with a fellow translater checking it out), no mention of the game is present. Grant it, the site itself is pretty bad in that it really offers no insight into anything, but you figured they would at least acknowledge it’s existence somewhere, right? The fact that the name of the conference isn’t known, and that the only source is a website without the game listed anywhere it leads to the fact that this information is most likely made up. When you browse the net for information, the only viable information is all based on Zelda In My Pocket’s above post. In short, are we to believe that some mystical site exists that only they know about while the rest of the internet is in the dark? If you can’t tell, I am calling this out as a hoax. It’s also highly convenient they mention at the end it may be a hoax, giving them a way out. This seems to me, at least, nothing more than an attention grabbing post for a desperate site. You will have my full apology if this turns out to be correct, but based on my journalism experience and research, and the fact they wont even mention where this news comes from for fear of “others stealing the scoop”, it all just seems way to suspicious to me. As an example, I could say I had an anonymous tip about the title of Zelda Wii and say I have information, an email, a website, but until I can confirm it I wont release that information and I guarantee the internet eats it up. We gets lots of traffic, all is right in the world. Except I am blatantly lying. Fact remains that when you are reporting news you need to do your research, especially if it’s as breaking a news story as this, and you need to provide your evidence. Otherwise? You look like a liar.